The phone rings. I answer it. And on the other end is a voice of desperation. The conversation begins like so many other calls we receive: "Hi, I'm Jane Smith with the City of Smithville. I'm stuck with having to find a commercial outdoor Christmas tree for our city and I have no idea what I'm doing! I'm so confused! Please help!" Underlying the tone of desperation is a sense of utter helplessness. Like many others before her, she's started off on a quest to find a commercial Christmas tree only to quickly find that it's not an easy task. In fact, it only took a few minutes for the bewildered Ms. Smith to realize that there are many merchants of commercial outdoor Christmas trees. And of course, they all claim to have the best tree at the best price. But who to trust? What questions does she need to ask? How does she know what tree will best serve the needs of her city? Buying a commercial Christmas tree can be a daunting task, but it needn't be. Just like any other large purchase, it's simply a matter of cutting through all the clutter, knowing what to look for and the questions to ask. But most large outdoor tree purchases require a substantial investment - from $5,000 all the way up to $100,000+ for very large trees. And if the tree is being purchased for a city or government entity politics can become involved, and a poor purchasing decision can have long-term consequences. So Ms. Smith was really feeling the pressure! Choosing the right tree for your business, organization or municipality isn't terribly complicated. But there are some very important things that you'll need to know to make a good buying decision. And there are a few potential pitfalls that you'll want to avoid. Every year we hear nightmare stories about people spending thousands of dollars on trees of poor quality. They were misled and made a poor purchasing decision. But because of the size of the investment, they often must live with the mistake. After all, not many can afford to toss an expensive commercial Christmas tree in the trash and just chalk it up to experience! So each time Christmas rolls around, year after year, the tree comes out of storage and they're reminded of their bad buying decision. It's like a nightmare that just won't go away! #1 - Where is the Tree Made? 75% of the commercial Christmas trees sold in the U.S. are made in China. That probably doesn't come as much of a surprise to you (in fact, 95% of all Christmas lights and decorations are made in China). But at Christmas Designers, we currently only sell trees that are Made in the USA! We sell a huge volume of commercial outdoor Christmas trees. And that makes us an attractive target for overseas manufacturers. We are constantly bombarded with sales offers from manufacturers in China and other overseas locations, all hoping for a piece of our tree business. But for many of our customers, quality isn't the only issue. Many of our customers are government organizations or municipalities. And for them, choosing anything other than a Made in the USA Christmas tree often opens a real can of worms. There's been a big push in recent years for buying Made in the USA products. And when voters or residents find out that a foreign made Christmas tree was purchased when there were better quality domestic trees available, well - let's just say it becomes one of those regrettable buying decisions. If your purchase is private, then you probably won't be subjected to the same level of scrutiny that a public purchase may face. But you can certainly score brownie points by purchasing an American made tree and advertising the fact through social media or at the site of the tree. Beyond the issue of scoring PR points or igniting a PR disaster, domestically made products typically do hold up better than imported products. And if something goes wrong or a part needs to be replaced, dealing with a US-based manufacturer is generally easier and faster. #2 - Does the Seller Install Outdoor Christmas Trees Themselves? These days, thanks to technology, anyone can sell just about anything you can imagine and do it all out of a small home office. Even big-ticket items like commercial outdoor Christmas trees can be sold to you without the retailer ever having seen, touched, installed or assembled one of the trees. Companies import these trees from China and then count on help from home sellers to sell their products for them. When you buy one of these trees it's drop-shipped directly to you from the importer, bypassing the retailer entirely. Small retailers operating under this business model usually have had no experience installing the products they sell to you. It's possible they've never even seen it other than in photos. This lack of experience can mean disappointment for you when you need help with the product - not what you expect after making a sizable investment in a big-ticket item like a large commercial Christmas tree. Be sure to always ask the salespeople about the experience they have with the trees. Ask if the company only sells the trees, or if they also do installations. It's also best to ask for references, just to confirm that they are being truthful with you. #3 Are the Trees used for Lease and Rental Decor Programs? 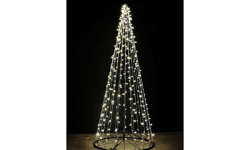 For Christmas businesses that are heavily involved in the installation of Christmas lights and decor, using top-quality products is very important. This is even more critical when the Christmas company is offering products on a rental or long-term lease basis. When a company offers a rental product, they won't make money unless that product - in this case a commercial outdoor Christmas tree - will hold up for many years without any significant problems. For that reason, most Christmas installation companies offering rental products will only deal in trees that hold up exceptionally well. How does that apply to you? It allows you to 'cheat' on your homework a bit by relying upon the vetting process that the tree has undergone by companies that have selected it for a rental tree. If the tree that you're considering purchasing is used as a rental tree, then you can be assured that the tree will deliver your money's worth in value. For example, we currently have an inventory of 25 used commercial Christmas trees ranging in size from 16' up to 50' that we rent out every year throughout South Florida. Some of these trees have been in service as long as 15 years. As an installation company, we know that the trees we rent must be durable enough to last. But they also must be attractive and trouble-free in order to bring back the same customers year after year. #4 Can the Commercial Christmas Tree be Grown Year After Year? We find that most people buying a tree, especially outdoor Christmas trees, want a bigger tree than they can afford. The larger trees - particularly trees that are 30 feet plus in height - require a sizeable investment. Often, organizations that are in the market for a tree simply can't afford a tree of the size that they really want. But perhaps additional funds will be available in future years. If you buy a tree that can be 'grown' as funds permit, then you can have the larger tree you really want when you can afford it - but without having to buy a new tree. So if you want a 30' tree for this year, but can really only afford a 24' tree? No problem, just grow it by 6' next year. Most commercial Christmas trees are designed and manufactured so that they can be expanded year after year. But if you want the ability to grow your tree, you'll want to take care not to purchase a tree that was made in China. That's because the factories in China routinely change specs from one production run to another. So the tree ring you buy this year to grow your tree may not match up with the tree you bought last year. The same is true of branches. The color of the garland, density of the foliage or the number of tips are often modified every few years, making it difficult to find a match for your tree. Buying a tree that has a long, stable track record of consistency in manufacture is important. Unfortunately, this isn't always easy to verify. And if you ask, it's likely that any sales rep at the company selling the tree you're considering will tell you that their tree will not change. But from our own experience, if the product is made in China, then there's a very good possibility that the tree being sold this year will not be an exact match for the same tree that will be available in the future. Fortunately, this is a non-issue for trees made in America. US factories are simply held to a higher standard; they can't get away with the product instability that China is known for. Outdoor Christmas trees are a big investment; prices range from $5,000 to more than $100,000. When you spend that kind of money, you expect the product to last for many years. And if it fails after only a few seasons, you might just have a budgetary disaster on your hands. So quite obviously it’s important to buy a tree that's manufactured to high standards, and is durable. But a tree must also be serviceable. That means that if any kind of damage occurs, for any reason, the components of the tree can be repaired or replaced. You wouldn't consider buying a $50,000 dollar car that couldn’t be repaired in the event of a fender-bender or maintenance issue. And the same logic certainly applies to buying a commercial Christmas tree. We have trees that have been in the field for more than 15 years, giving great service year after year. Because these trees are fully serviceable, when a problem occurs - as will inevitably happen over the long term - we can repair it. So consider durability and serviceability to be must-have features for any tree you've selected as a candidate for purchase. It's a Buying Decision That Can Offer Lots of Joy - Or Lots of Pain! There's no question that an outdoor commercial Christmas tree offers great value in terms of PR and customer goodwill. They can serve as a magnetic draw, enticing potential customers and patrons to your place of business like moths to a glowing lamp. And the delight that they offer to young and old alike helps to make Christmas the most wonderful time of the year. But a commercial Christmas tree is a major investment. And if you're the person tasked with heading up the job of selecting and purchasing a tree, you'd better know what you're doing. Heed the tips you've read in this article, and you'll do just fine.